 Exploring Burgundy - Vintage 2005 We begin a series of Friday Burgundy tutorials with a look at the vintage that everyone seems to love. A fine young Burgundy with excellent aging potential, it's a good example of 2005 vintage quality. With less than three months remaining before our July Burgundy tour with French Wine Explorers (more about that here), let's devote a few Friday editions to a weekly exploration of this much-loved but hard-to-understand wine region. Why is Burgundy so difficult? As I opined in a similar article several years ago, there are at least two good reasons: First, thanks to historical accidents ranging from early French inheritance laws to land ownership reforms under Napoleon, Burgundy's vineyards are divided into thousands of tiny parcels, each bearing a distinct name, status and reputation. As a quick start, remember that Burgundy's core region around the small city of Beaune is called the Cote d'Or ("East-facing hillside" or, if you prefer the romantic legend, "Golden slope"), and that this is further divided into the Cote de Nuits on its northern end and the Cote de Beaune in the south. But this is only the beginning of a long (but tasty) education process to which would-be lovers of Burgundy must submit. Another significant barrier is price. Between the rising Euro and increasing demand, introductory Burgundy these days starts in the $15 range for simple Pinot Noir and Chardonnay bottlings bearing the generic "Bourgogne" designation). It's difficult to sample Burgundies from more narrowly defined - and desirable - real estate for much less than $25, and you almost have to cross the $40 line before you reach truly interesting territory. For most of us, these price ranges don't encourage casual experimentation. Finally, Burgundy's unpredictable climate fosters significant differences among Burgundy vintages, and they're not all great. Facing this trio of challenges - complexity, variability and price - and it's no surprise that many wine enthusiasts simply throw up their hands and decide that learning Burgundy is not worth the bother. But the treasure is worth the toll; and if there's no real substitute for visiting the region and tasting its great wine and food (insert another hint that you join us on our tour), it's certainly possible to glean the basics through reading and judicious tasting. And there's no time like the present to do so, while the outstanding 2005 Burgundy vintage is turning up on retail shelves around the world. I can't recall when I've seen such unanimous praise for a Burgundy vintage. Usually, thanks perhaps to the aforementioned complications of the region, Burgundy vintages are controversial, and never more so than in 2003, when Wine Spectator and others who fancy fat, low-acid and fruit-forward California-style wines raved about the Burgundies while many other observers (including this one) steered well clear of what we considered bizarrely idiosyncratic wines. No such controversy seems to surround the 2005 Burgundies, of which my pal Allen Meadows wrote in his influential Burghound.com: "Let's cut directly to the chase ... 2005 is quite simply the best top to bottom vintage that I have ever seen, period, full stop. ... 2005 is a brilliant vintage with virtually nothing to dislike (except perhaps the prices) and here is the key point: It's also great from top to bottom," he went on, from grand and premier crus right through villages and regional wines. At London's respected Berry Bros. & Rudd, Master of Wine Jasper Morris declared, "This is an extraordinary year for the red wines of Burgundy in both the Cote de Beaune and especially in the Cote de Nuits. ... the profile of the vintage is definitely more red fruit than black and ... there is a marvelous refreshing mineral aspect which keeps these wines lively and dynamic ... These factors set 2005 apart from other years and almost certainly pushes it above the famous 1990 and 1999 vintages." Even Wine Spectator, despite its usual affection for New World-style wines, was smitten, Senior Editor Bruce Sanderson reporting, "The 2005 vintage for red and white Burgundy has everything you could want: ripe fruit, fresh acidity, well-integrated tannins and great balance. Even at this young stage, many of the wines reveal gorgeous fruit flavors and terroir." With such high praise from so many quarters, 2005 appears to be one of those vintages in which it's going to be hard to miss on quality - if you can bear the price. For today's tasting, let's take a look at a quality villages wine from a good producer in Savigny-les-Beaune, a stretch of the Cote de Beaune that's known for respectable quality and good value. At $28, it's not a wine for everyday quaffing, but by Burgundy standards, it would be difficult to find a wine of similar quality for much less. FOOD MATCH: Pinot Noir is one of the most versatile wines with food, and that goes double for good Burgundy. Beef or lamb would be perfect; salmon or sashimi-quality tuna just fine. I irreverently (but successfully) paired it with something completely different, a rustic dish of Italian sausage sauteed with peppers and onions over penne pasta. VALUE: "Cheap Burgundy," I'm afraid, is a real oxymoron in today's market. But if you're prepared to invest in quality Burgundy, this exceptionally fine villages bottling is more than competitive at $30 or less. WHEN TO DRINK: This wine can certainly be drunk with enjoyment now, but it absolutely has the material needed to cellar with considerable potential at least over the short to middle term, and could evolve into something special with five years under good storage conditions. 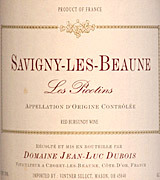 Savigny-les-Beaune = "Sah-veen-ye leh Bone"
Find vendors and compare prices for Jean-Luc Dubois' "Les Picotins" on Wine-Searcher.com. As I've been saying, Burgundy is one of the world's greatest wine regions but also one of the most difficult to learn. Its patchwork of tiny vineyards is intriguing, but almost bewilderingly complicated. There's no better way to learn Burgundy than being there, touring the wine roads, visiting historic producers like the pictured Clos de Vougeot, and tasting with a trusted guide.